Now it's time to act on your CEMDNA Playbook Strategy, building on the Measure and Analyze phases of your CEM strategy. Quarterly frequency with corrective action Look at your results on a quarterly basis and take appropriate corrective action based on results of Phase 2 steps. Closed-loop Action Alerts A critical element of your Corrective Action Plan is to "close the loop" on every Action Alert, both positive and negative, to be sure that you address the need to take any further action. Prepare your corrective action plan Corrective action plans address critical external customer issues. Such plans should be formulated prior to the Act Phase, reflecting your interaction with key accounts based upon their experience and issues that emerge. Remember, you want to be "married" to your key accounts, and every good marriage is a partnership, built on mutual trust and respect. You also will know what corrective actions are needed based on your activities in Phase 2, Analyze. While implementing corrective actions, be sure to address internal systemic issue and customer-related processes. Implement your corrective action plan Assign responsibility to front-line and management-level personnel to carry out the external and internal plans you've just developed. Verify and communicate results Verify that the corrective actions have resolved customer issues. Be proactive and reach out to customers who may or have experienced the same issue and present your solution. Be sure to address any specific systemic problems that caused the problem in the first place. If your organization is like the majority of companies, you consider the quality and performance of your employees as a major business asset. Indeed, many firms list "our people" as their biggest competitive differentiator. It's also true that payroll, benefits and other direct expenses linked to employees are the number one expense item for most organizations. The cost of replacing employees is similar to the cost of acquiring new customers, so you do not want to have a high turnover among either group. Add to this the fact that employees are the ones who interact most frequently with your external stakeholders, then it becomes obvious that "happy employees" breed satisfied, loyal customers, suppliers, business partners and shareholders. Nevertheless, the vast majority of organizations do not have a formal, structured program in place to engage, reward and retain employees for delivering outstanding customer service or to educate them on strengthening their CEM knowledge and skills. Employee engagement means understanding, measuring and improving the emotional relationship between employees and their work. Employee engagement is more than employee satisfaction; it relates to measuring and improving items that will directly affect business outcomes. Employee engagement is typically not wholly owned by the HR organization, but requires the active involvement of line management. In a recent Gallup survey, more engaged companies outperformed the earnings-per-share of their competitors by 18%. 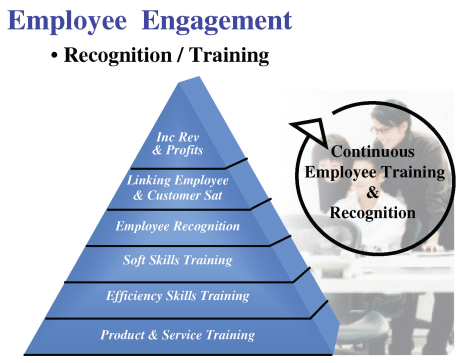 Employee Recognition/Compensation Set balanced goals based on achieving key performance indicators (KPIs) for customer satisfaction and loyalty. Recognize and reward employees individually and/or by groups. Most importantly, link employee compensation to achieving measurable gains in customer satisfaction. Employee Training Commit to a continuous employee CEM training program, including "soft skills" (people skills) as well as technical or job-based competence. In addition, take advantage of certification courses that are available in Customer Relationship Management (CRM) as well as Customer Experience Management (CEM). This advanced-level instruction can pay big dividends for your company and provide career advancement for employees. Learn more about our Employee Rewards Program. Learn more about our certified CEM Professional (CEMPRO) training. CEMDNA Change Management is an approach to transitioning individuals, teams, and organizations from a current state where the customer experience is not primary to a desired, future state where the customer is centric to all decision making. It involves an organizational process aimed at helping change stakeholders to accept and embrace customer centricity in their business environment. Our services include coaching management personnel to implement a CEM Strategy and providing the leadership skills necessary to meet this objective. These leadership development sessions integrate the CEMDNA Playbook Strategy with the specific objectives of your CEM program. We use "real life" examples from your existing customer base and create account plans for driving customer loyalty, making necessary course corrections to achieve a customer loyalty status. We make use of performance metrics, such as financial results, operational efficiency, leadership commitment, communication effectiveness and the perceived need for change to design appropriate strategies in order to avoid change failures or resolve troubled change projects. The objective of implementing CEMDNA Change Management is to develop a management team that is able to lead their respective groups to deliver services that continuously exceed customer expectations. Further, our goal is to transfer theses skills to their respective department personnel, resulting in the transformation of an organization's CEM strategy into the company's DNA.